Al-Farabi (/ˌælfəˈrɑːbi/; Arabic: ابو نصر محمد بن محمد الفارابي‎‎ Abū Naṣr Muḥammad ibn Muḥammad Al Fārābī;, known in the West as Alpharabius (c. 872 in Fārāb – between 14 December, 950 and 12 January, 951 in Damascus), was a renowned philosopher and jurist who wrote in the fields of political philosophy, metaphysics, ethics and logic. He was also a scientist, cosmologist, mathematician and music scholar. The existing variations in the basic accounts of al-Farabi's origins and pedigree indicate that they were not recorded during his lifetime or soon thereafter by anyone with concrete information, but were based on hearsay or guesses (as is the case with other contemporaries of al-Farabi). Little is known about his life.Early sources include an autobiographical passage where al-Farabi traces the history of logic and philosophy up to his time, and brief mentions by Al-Masudi, Ibn al-Nadim and Ibn Hawqal. Said Al-Andalusi wrote a biography of al-Farabi. Arabic biographers of the 6th-7th and 12th-13th centuries thus had few facts to hand, and used invented stories about his life. His name was Abū Naṣr Muḥammad b. Muḥammad Farabi, sometimes with the family surname al-Ṭarḵānī, i.e., the element Ṭarḵān appears in a nisba. His grandfather was not known among his contemporaries, but a name, Awzalaḡ, suddenly appears later in the writings of Ibn Abī Uṣaibiʿa, and of his great-grandfather in those of Ibn Khallikan. His birthplace could have been Fārāb on the Jaxartes (Syr Darya) in modern Kazakhstan, or maybe Fāryāb in Greater Khorasan (modern day Afghanistan). The older PersianPārāb (in Ḥudūd al-ʿĀlam) or Fāryāb (also Pāryāb), is a common Persian toponym meaning "lands irrigated by diversion of river water". By the 13th century, Fārāb on the Jaxartes was known as Otrār. Scholars largely agree that Farabi's ethnic background is not now knowable. Medieval Arab historian Ibn Abī Uṣaibiʿa (died in 1269)—al-Farabi's oldest biographer—mentions in his ʿOyūn that al-Farabi's father was of Persian descent. Al-Shahrazūrī who lived around 1288 A.D. and has written an early biography also states that Farabi hailed from a Persian family.According to Majid Fakhry, an Emeritus Professor of Philosophy at Georgetown University, Farabi's father "was an army captain of Persian extraction." Dimitri Gutas notes that Farabi's works contain references and glosses in Persian, Sogdian, and even Greek, but not Turkish.Sogdian has also been suggested as his native language and the language of the inhabitants of Fārāb. Muhammad Javad Mashkoor argues for an Iranian-speaking Central Asian origin. A Persian origin has been discussed by other sources as well. The oldest known reference to a Turkic origin is given by the medieval historian Ibn Khallikān (died in 1282), who in his work Wafayāt (completed in 669/1271) states that Farabi was born in the small village of Wasij near Fārāb (in what is today Otrar, Kazakhstan) of Turkic parents. Based on this account, some modern scholars say he is of Turkic origin. 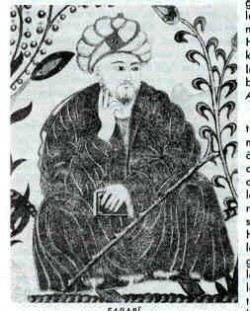 Dimitri Gutas, an American Arabist of Greek origin, criticizes this, saying that Ibn Khallikān's account is aimed at the earlier historical accounts by Ibn Abī Uṣaibiʿa, and serves the purpose to "prove" a Turkic origin for al-Farabi, for instance by mentioning the additional nisba (surname) "al-Turk" (arab. "the Turk")—a nisba Farabi never had. However, Abu al-Fedā', who copied Ibn Ḵhallekān, corrected this and changed al-Torkī to the phrase "wa-kāna rajolan torkīyan", meaning "he was a Turkish man." In this regard, Oxford professor C.E. Bosworth notes that "great figures [such] as al-Farabi, al-Biruni, and ibn Sina have been attached by over enthusiastic Turkish scholars to their race". Al-Farabi spent almost his entire life in Baghdad. In the auto-biographical passage preserved by Ibn Abī Uṣaibiʿa, Farabi stated that he had studied logic, medicine and sociology with Yūḥannā bin Ḥaylān up to and including Aristotle's Posterior Analytics, i.e., according to the order of the books studied in the curriculum, Fārābī was claiming that he had studied Porphyry's Eisagoge and Aristotle's Categories, De Interpretatione, Prior and Posterior Analytics. His teacher, bin Ḥaylān, was a Christian cleric. This period of study was probably in Baghdad, where Al-Masudi records that Yūḥannā died during the caliphate of al-Moqtader (295-320/908-32). He was in Baghdad at least until the end of September 942, as recorded in notes in his Mabādeʾ ārāʾ ahl al-madīna al-fāżela. He finished the book in Damascus the following year (331), i.e., by September 943). He also lived and taught for some time in Aleppo. Farabi later visited Egypt, finishing six sections summarizing the book Mabādeʾ in Egypt in 337/July 948-June 949 when he returned to Syria, where he was supported by Sayf al-Dawla, the Hamdanid ruler.. Al-Masudi, writing barely five years after the fact (955-6, the date of the composition of the Tanbīh), says that Farabi died in Damascus in Rajab 339 (between 14 December 950 and 12 January 951). Henry Corbin writes that the evidence supports the opinion common in Iran that al-Farabi was Shiite. Corbin argues that there are many similarities between what he calls Farabi's "prophetic philosophy" and the teachings of Shiite Imams. Najjar Fauzi also refers to the point that Al-Farabi may be Shiite because his political philosophy seems to be influenced by Shiite sects. Al-Farabi also wrote a commentary on Aristotle's work, and one of his most notable works is Al-Madina al-Fadila (اراء اهل المدينة الفاضلة و مضاداتها) where he theorized an ideal state as in Plato's The Republic. Al-Farabi represented religion as a symbolic rendering of truth, and, like Plato, saw it as the duty of the philosopher to provide guidance to the state. Al-Farabi incorporated the Platonic view, drawing a parallel from within the Islamic context, in that he regarded the ideal state to be ruled by the prophet-imam, instead of the philosopher-king envisaged by Plato. Al-Farabi argued that the ideal state was the city-state of Medina when it was governed by the prophet Muhammad as its head of state, as he was in direct communion with Allah whose law was revealed to him. Al-Farabi wrote a short treatise "On Vacuum", where he thought about the nature of the existence of void. He also may have carried out the first experiments concerning the existence of vacuum, in which he investigated handheld plungers in water. His final conclusion was that air's volume can expand to fill available space, and he suggested that the concept of perfect vacuum was incoherent. Wrote Social Psychology and Principles of the Opinions of the Citizens of the Virtuous City, which were the first treatises to deal with social psychology. He stated that "an isolated individual could not achieve all the perfections by himself, without the aid of other individuals," and that it is the "innate disposition of every man to join another human being or other men in the labor he ought to perform." He concluded that to "achieve what he can of that perfection, every man needs to stay in the neighborhood of others and associate with them." The main influence on al-Farabi's philosophy was the neo-Aristotelian tradition of Alexandria. A prolific writer, he is credited with over one hundred works. Amongst these are a number of prolegomena to philosophy, commentaries on important Aristotelian works (such as the Nicomachean Ethics) as well as his own works. His ideas are marked by their coherency, despite drawing together of many different philosophical disciplines and traditions. Some other significant influences on his work were the planetary model of Ptolemy and elements of Neo-Platonism, particularly metaphysics and practical (or political) philosophy (which bears more resemblance to Plato's Republic than Aristotle's Politics). In the handing down of Aristotle’s thought to the Christian west in the middle ages, al-Farabi played an essential part as appears in the translation of Farabi’s Commentary and Short Treatise on Aristotle’s de Interpretatione that F.W. Zimmermann published in 1981. Farabi had a great influence on Maimonides, the most important Jewish thinker of the middle ages. Maimonides wrote in Arabic a Treatise on logic, the celebrated Maqala fi sina at al-mantiq. In a wonderfully concise way, the work treats of the essentials of Aristotelian logic in the light of comments made by the Persian philosophers: Avicenna and above all al-Farabi. To use Maimonides’ words, if Aristotle is the First Master the second one is undoubtedly Farabi. Rémi Brague in his book devoted to the Treatise stresses the fact that Farabi is the only thinker mentioned therein. Al-Farabi as well as Ibn Sina and Averroes have been recognized as Peripatetics (al-Mashsha’iyun) or rationalists (Estedlaliun) among Muslims. However, he tried to gather the ideas of Plato and Aristotle in his book "The gathering of the ideas of the two philosophers". According to Adamson, his work was singularly directed towards the goal of simultaneously reviving and reinventing the Alexandrian philosophical tradition, to which his Christian teacher, Yuhanna bin Haylan belonged. His success should be measured by the honorific title of "the second master" of philosophy (Aristotle being the first), by which he was known. Interestingly, Adamson also says that he does not make any reference to the ideas of either al-Kindi or his contemporary, Abu Bakr al-Razi, which clearly indicates that he did not consider their approach to Philosophy as a correct or viable one. Al-Farabi's cosmology is essentially based upon three pillars: Aristotelian metaphysics of causation, highly developed Plotinian emanational cosmology and the Ptolemaic astronomy. In his model, the universe is viewed as a number of concentric circles; the outermost sphere or "first heaven", the sphere of fixed stars, Saturn, Jupiter, Mars, the Sun, Venus, Mercury and finally, the Moon. At the centre of these concentric circles is the sub-lunar realm which contains the material world. Each of these circles represent the domain of the secondary intelligences (symbolized by the celestial bodies themselves), which act as causal intermediaries between the First Cause (in this case, God) and the material world. Furthermore these are said to have emanated from God, who is both their formal and efficient cause. In his discussion of the First Cause (or God), al-Farabi relies heavily on negative theology. He says that it cannot be known by intellectual means, such as dialectical division or definition, because the terms used in these processes to define a thing constitute its substance. Therefore if one was to define the First Cause, each of the terms used would actually constitute a part of its substance and therefore behave as a cause for its existence, which is impossible as the First Cause is uncaused; it exists without being caused. Equally, he says it cannot be known according to genus and differentia, as its substance and existence are different from all others, and therefore it has no category to which it belongs. If this were the case, then it would not be the First Cause, because something would be prior in existence to it, which is also impossible. This would suggest that the more philosophically simple a thing is, the more perfect it is. And based on this observation, Adamson says it is possible to see the entire hierarchy of al-Farabi's cosmology according to classification into genus and species. Each succeeding level in this structure has as its principal qualities multiplicity and deficiency, and it is this ever-increasing complexity that typifies the material world. Al-Farabi divides intellect into four categories: potential, actual, acquired and the Agent. The first three are the different states of the human intellect and the fourth is the Tenth Intellect (the moon) in his emanational cosmology. The potential intellect represents the capacity to think, which is shared by all human beings, and the actual intellect is an intellect engaged in the act of thinking. By thinking, al-Farabi means abstracting universal intelligibles from the sensory forms of objects which have been apprehended and retained in the individual's imagination. This motion from potentiality to actuality requires the Agent Intellect to act upon the retained sensory forms; just as the Sun illuminates the physical world to allow us to see, the Agent Intellect illuminates the world of intelligibles to allow us to think. This illumination removes all accident (such as time, place, quality) and physicality from them, converting them into primary intelligibles, which are logical principles such as "the whole is greater than the part". The human intellect, by its act of intellection, passes from potentiality to actuality, and as it gradually comprehends these intelligibles, it is identified with them (as according to Aristotle, by knowing something, the intellect becomes like it). Because the Agent Intellect knows all of the intelligibles, this means that when the human intellect knows all of them, it becomes associated with the Agent Intellect's perfection and is known as the acquired Intellect. While this process seems mechanical, leaving little room for human choice or volition, Reisman says that al-Farabi is committed to human voluntarism. This takes place when man, based on the knowledge he has acquired, decides whether to direct himself towards virtuous or unvirtuous activities, and thereby decides whether or not to seek true happiness. And it is by choosing what is ethical and contemplating about what constitutes the nature of ethics, that the actual intellect can become "like" the active intellect, thereby attaining perfection. It is only by this process that a human soul may survive death, and live on in the afterlife. According to al-Farabi, the afterlife is not the personal experience commonly conceived of by religious traditions such as Islam and Christianity. Any individual or distinguishing features of the soul are annihilated after the death of the body; only the rational faculty survives (and then, only if it has attained perfection), which becomes one with all other rational souls within the agent intellect and enters a realm of pure intelligence. Henry Corbin compares this eschatology with that of the Ismaili Neo-Platonists, for whom this process initiated the next grand cycle of the universe. However, Deborah Black mentions we have cause to be skeptical as to whether this was the mature and developed view of al-Farabi, as later thinkers such as Ibn Tufayl, Averroes and Ibn Bajjah would assert that he repudiated this view in his commentary on the Nicomachean Ethics, which has been lost to modern experts. In his treatment of the human soul, al-Farabi draws on a basic Aristotelian outline, which is informed by the commentaries of later Greek thinkers. He says it is composed of four faculties: The appetitive (the desire for, or aversion to an object of sense), the sensitive (the perception by the senses of corporeal substances), the imaginative (the faculty which retains images of sensible objects after they have been perceived, and then separates and combines them for a number of ends), and the rational, which is the faculty of intellection. It is the last of these which is unique to human beings and distinguishes them from plants and animals. It is also the only part of the soul to survive the death of the body. Noticeably absent from these scheme are internal senses, such as common sense, which would be discussed by later philosophers such as Avicenna and Averroes. Special attention must be given to al-Farabi's treatment of the soul's imaginative faculty, which is essential to his interpretation of prophethood and prophetic knowledge. In addition to its ability to retain and manipulate sensible images of objects, he gives the imagination the function of imitation. By this he means the capacity to represent an object with an image other than its own. In other words, to imitate "x" is to imagine "x" by associating it with sensible qualities that do not describe its own appearance. This extends the representative ability of the imagination beyond sensible forms and to include temperaments, emotions, desires and even immaterial intelligibles or abstract universals, as happens when, for example, one associates "evil" with "darkness". The prophet, in addition to his own intellectual capacity, has a very strong imaginative faculty, which allows him to receive an overflow of intelligibles from the agent intellect (the tenth intellect in the emanational cosmology). These intelligibles are then associated with symbols and images, which allow him to communicate abstract truths in a way that can be understood by ordinary people. Therefore what makes prophetic knowledge unique is not its content, which is also accessible to philosophers through demonstration and intellection, but rather the form that it is given by the prophet's imagination. The practical application of philosophy was a major concern expressed by al-Farabi in many of his works, and while the majority of his philosophical output has been influenced by Aristotelian thought, his practical philosophy was unmistakably based on that of Plato. In a similar manner to Plato's Republic, al-Farabi emphasized that philosophy was both a theoretical and practical discipline; labeling those philosophers who do not apply their erudition to practical pursuits as "futile philosophers". The ideal society, he wrote, is one directed towards the realization of "true happiness" (which can be taken to mean philosophical enlightenment) and as such, the ideal philosopher must hone all the necessary arts of rhetoric and poetics to communicate abstract truths to the ordinary people, as well as having achieved enlightenment himself. Al-Farabi compared the philosopher's role in relation to society with a physician in relation to the body; the body's health is affected by the "balance of its humours" just as the city is determined by the moral habits of its people. The philosopher's duty, he wrote, was to establish a "virtuous" society by healing the souls of the people, establishing justice and guiding them towards "true happiness". Of course, al-Farabi realized that such a society was rare and required a very specific set of historical circumstances to be realized, which means very few societies could ever attain this goal. He divided those "vicious" societies, which have fallen short of the ideal "virtuous" society, into three categories: ignorant, wicked and errant. Ignorant societies have, for whatever reason, failed to comprehend the purpose of human existence, and have supplanted the pursuit of happiness for another (inferior) goal, whether this be wealth, sensual gratification or power. Al-Farabi mentions "weeds" in the virtuous society: those people who try to undermine its progress towards the true human end. The best known Arabic source for al-Farabi's political philosophy is his work titled, al-Madina al-fadila (The Virtuous City). Whether or not al-Farabi actually intended to outline a political programme in his writings remains a matter of dispute amongst academics. Henry Corbin, who considers al-Farabi to be a crypto-Shi'ite, says that his ideas should be understood as a "prophetic philosophy" instead of being interpreted politically. On the other hand, Charles Butterworth contends that nowhere in his work does al-Farabi speak of a prophet-legislator or revelation (even the word philosophy is scarcely mentioned), and the main discussion that takes place concerns the positions of "king" and "statesmen". Occupying a middle position is David Reisman, who like Corbin believes that al-Farabi did not want to expound a political doctrine (although he does not go so far to attribute it to Islamic Gnosticism either). He argues that al-Farabi was using different types of society as examples, in the context of an ethical discussion, to show what effect correct or incorrect thinking could have. Lastly, Joshua Parens argues that al-Farabi was slyly asserting that a pan-Islamic society could not be made, by using reason to show how many conditions (such as moral and deliberative virtue) would have to be met, thus leading the reader to conclude that humans are not fit for such a society. Some other authors like Mykhaylo Yakubovych attest that for al-Farabi religion (milla) and philosophy (falsafa) constituted the same praxeological value (i.e. basis for amal al-fadhil—"virtuous deed"), while its epistemological level (ilm—"knowledge") was different.